James Hunt is an agronomist and crop physiologist specialising in water limited productivity of dry-land cropping and mixed farming systems. His research focuses on using combinations of management and genetics to increase productivity and profitability of grain-based farming systems. Prior to joining La Trobe, he worked for CSIRO Agriculture for seven years. 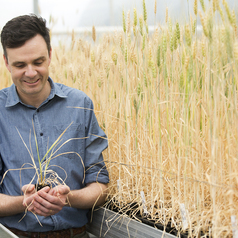 He has received scientific awards in 2013, 2014 and 2016, and the outcomes of his research have been widely adopted by grain growers across south eastern Australia.